The fixtures for the new season have now been transferred to englandrugby.com. They now show those fixture changes which have been applied for and approved. We have a number of other applications where we have yet to receive the agreement of both clubs. If a change you have applied for does not yet show do check if your opponents have also applied. 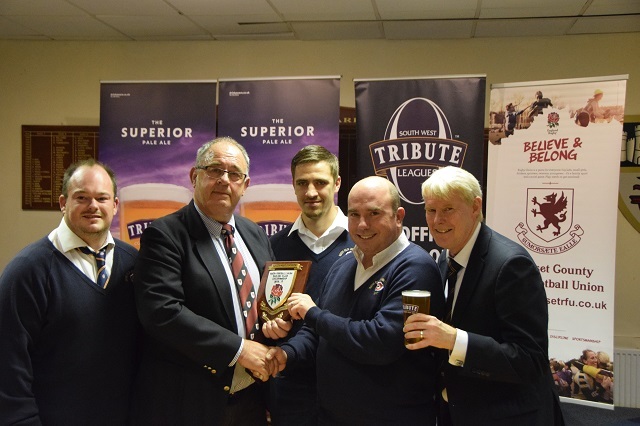 The final Tribute Team of the Month award winners of the 2016-17 season have been presented with their case of Tribute Ale. 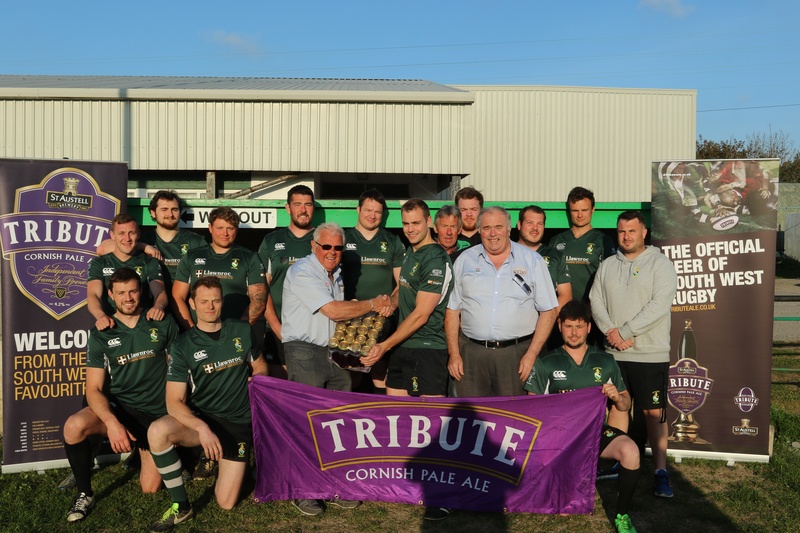 One of the highlights of the Cornwall rugby calendar took place on Friday 19th May at the St Austell Brewery - home of sponsors Tribute. 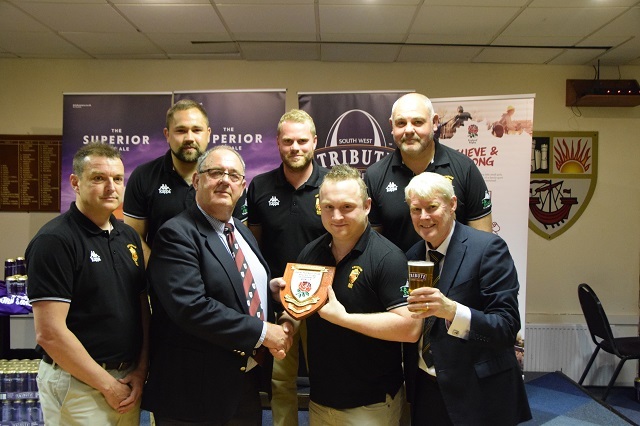 Clubs met to see the 2016-17 winners presented with their prizes. 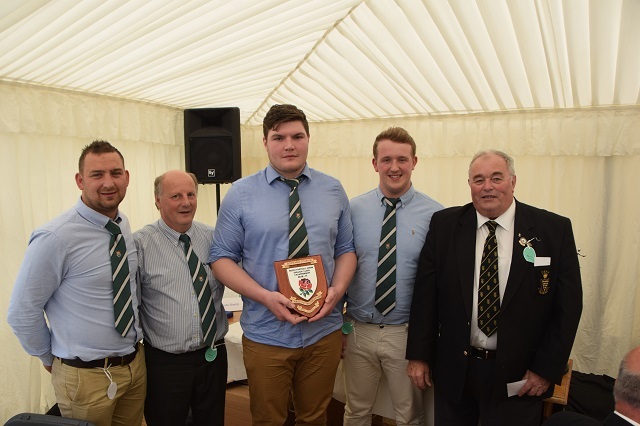 Ahead of the Devon v Cornwall County Championship game at Ivybridge RFC, the 2016-17 award winners were presented with their shields in the presence of RFU President Peter Baines. 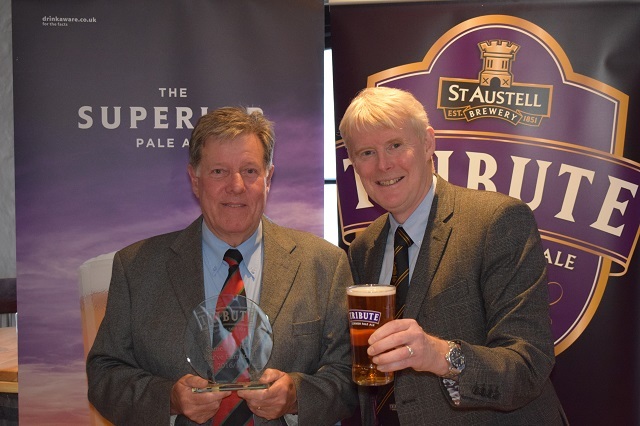 The awards were presented by Denis Preece, South West Divisional Organising Committee, and Marc Bishop of sponsors St Austell Brewery - brewers of Tribute Ale. 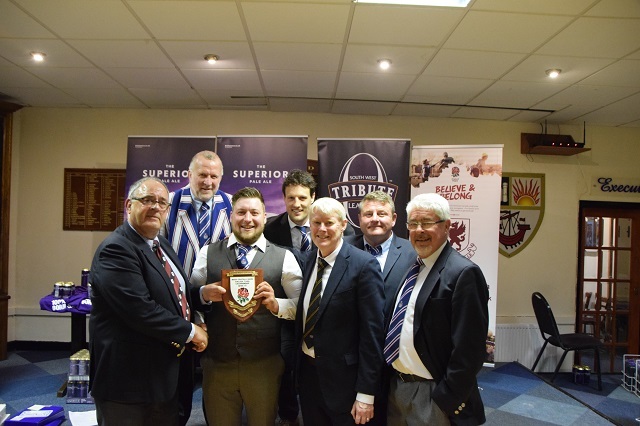 Clubs from all over Somerset converged on Weston-super-Mare RFC on Friday 12th May to congratulate the county's award winners for the 2016-17 season. 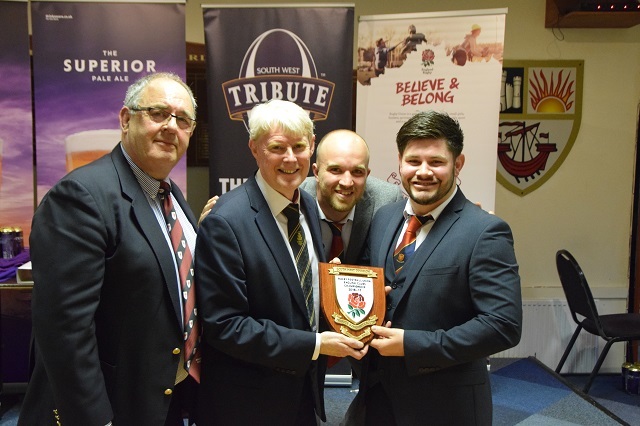 The final Tribute Team of the Month Awards for this season have been announced. 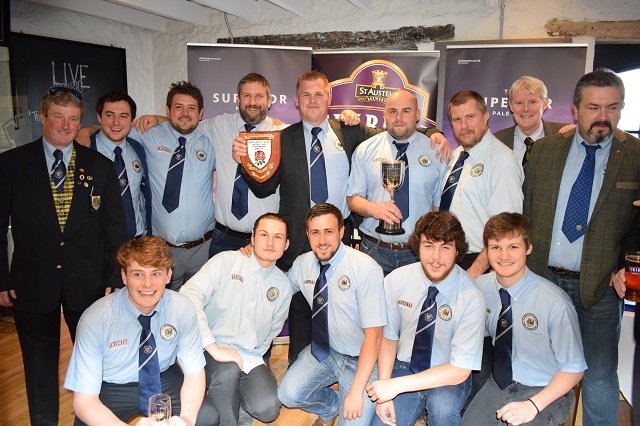 In Cornwall, Lankelly-Fowey secured the Tribute Cornwall League 2 title by a point after beating runners up Illogan Park 24-16 away from home. 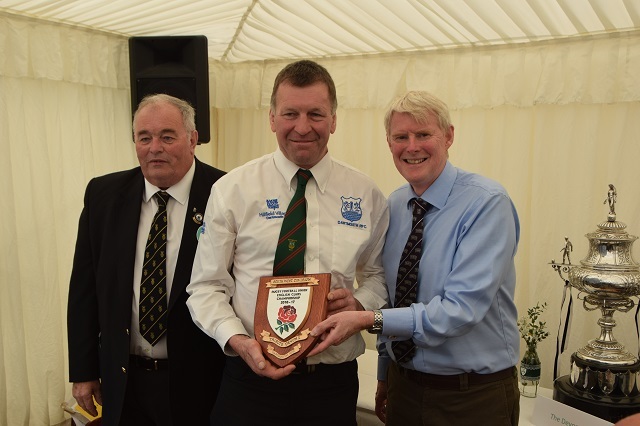 Cullompton enjoyed a 100% three game league run in Tribute Western Counties West to lift the prize in Devon. 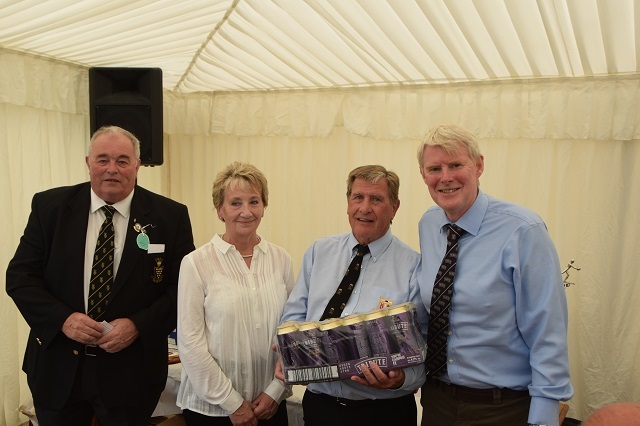 They finished runners up and went on to win their playoff match at Chew Valley to win promotion to Tribute South West 1 West. 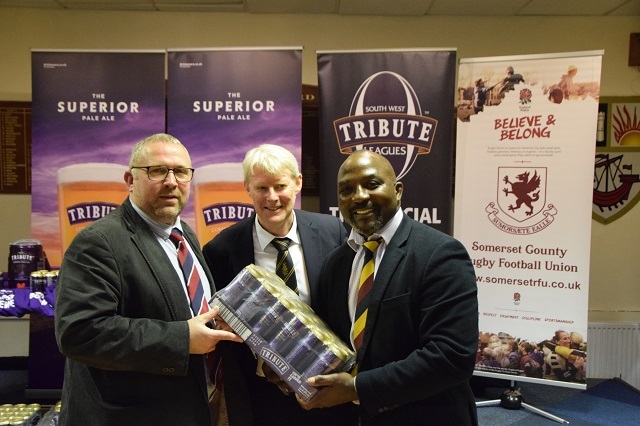 Tor from Tribute Somerset Premier won two league games out of three in April to earn their county’s prize. They ended the season in fifth place. 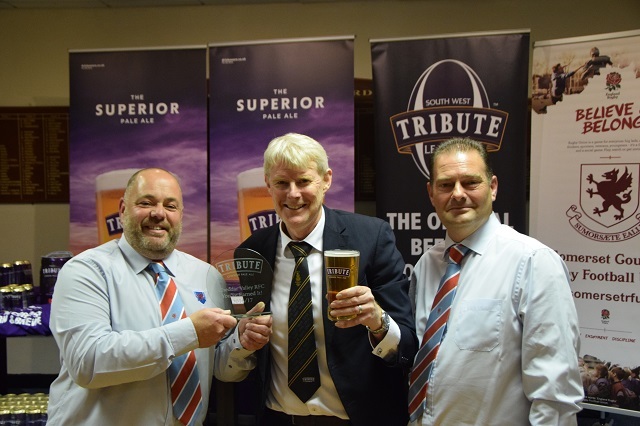 All three will receive a case of Tribute Ale at their end of season county presentations over the next ten days. 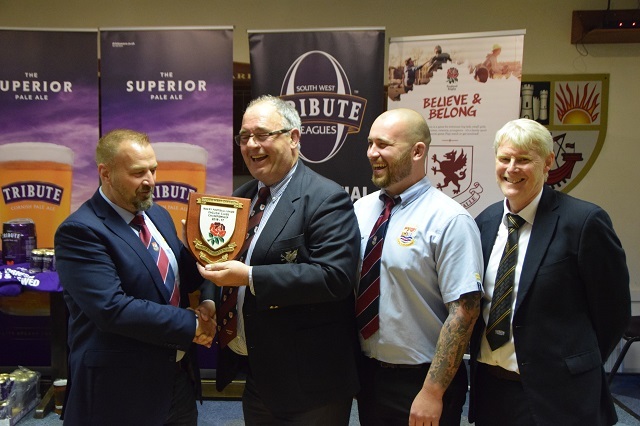 The provisional structure for the SW Leagues in 2017-2018 has been drawn up and can be found here. 1) We are still awaiting confirmation on level transfers into the SW from outside the division. 2) The publishing of this document is for clubs' information and to allow any omissions to be pointed out - it is not intended to spark a debate about which league a club would like to be in. Once the structure is confirmed work will commence on the fixtures with the intention of publishing them at the end of May. The end of season play-offs will be staged on Saturday 29th April 2017. 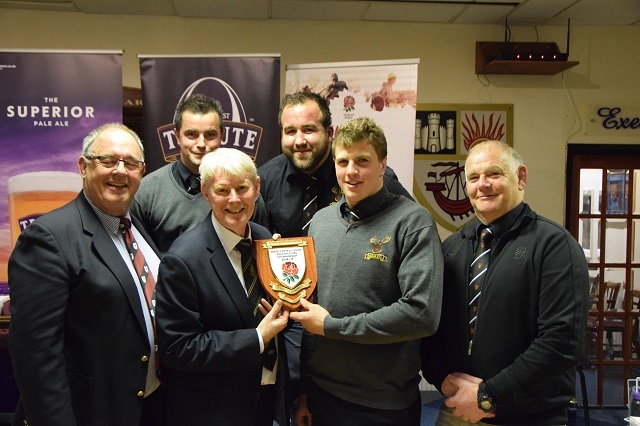 Truro, Saltash and Spartans will all be aiming for a place in a Twickenham final on Saturday 15th April. Truro, who have had away wins at Torquay, Chew Valley and Swanage & Wareham to reach this stage of the Intermediate Cup, must travel again. Their opponents are Charlton Park based in South East London. They have completed their league programme, finishing fourth in London 2 South East. Saltash must also travel east. They go to Farnham in Surrey, following home wins over Withycombe, Wiveliscombe and Swanage & Wareham. Farnham have suffered only one competitive defeat all season and have won the championship in London 3 South West by a country mile. Spartans, the current leaders of Gloucester 1, have home advantage for their Semi Final against Old Whitgiftians. The Surrey club have suffered three successive league defeats since their victory in the last round of the Junior Vase. That form cost them the chance of taking the Surrey 1 title. 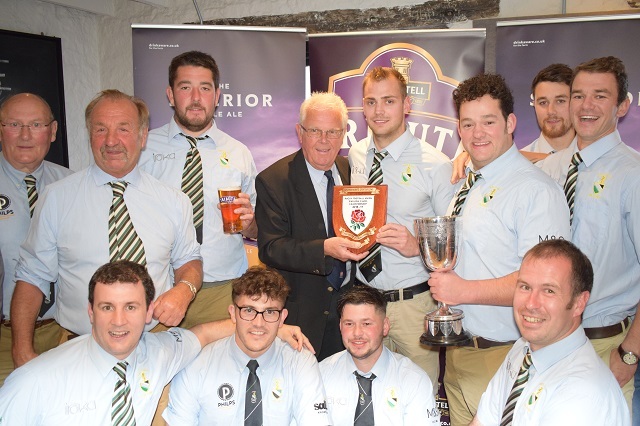 Spartans' Vase successes came over Bristol Barbarians, New Cross and Calne as they chase a possible League and Vase double. 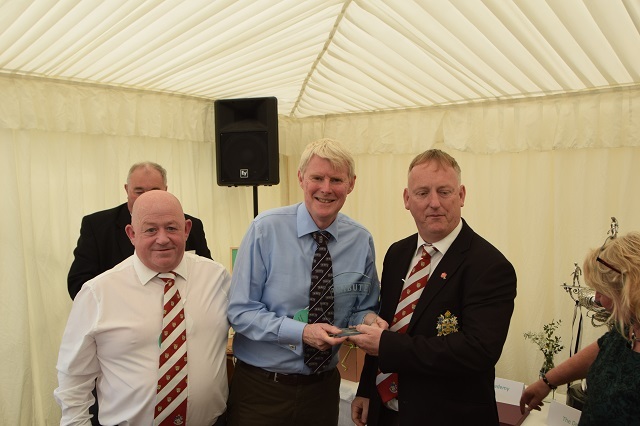 A 100 percent league record in March helped Wiveliscombe to lift the Tribute Team of the Month award for March in Somerset. 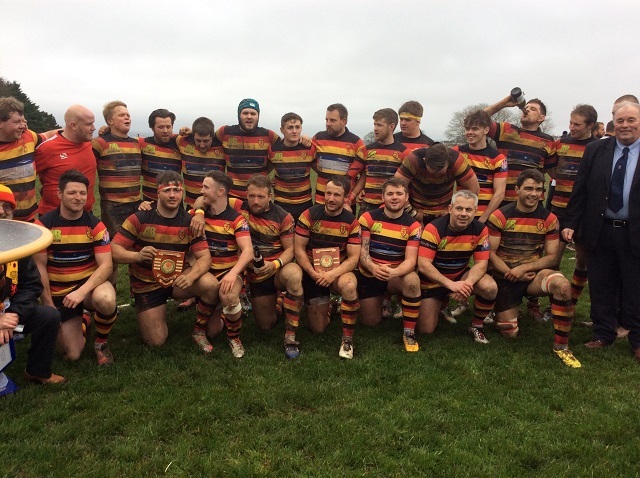 Among their successes was a narrow 32-33 victory at Nailsea & Backwell. They ended the month in fourth place with three matches left to try to claim a play-off place in Tribute Somerset Premier. 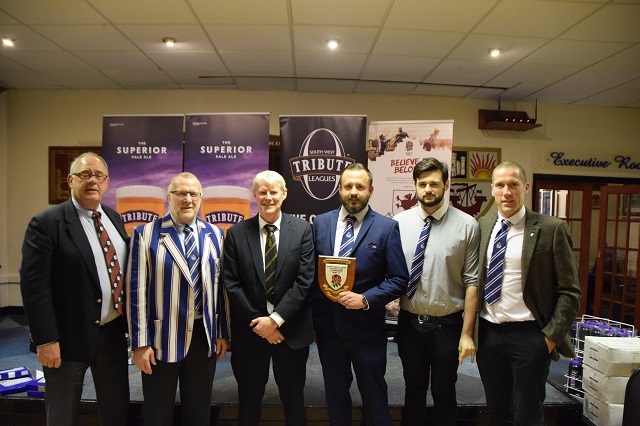 Two wins in March extended Old Technicians unbeaten run to 11 games in Tribute Devon 2 and lifted them the county award. 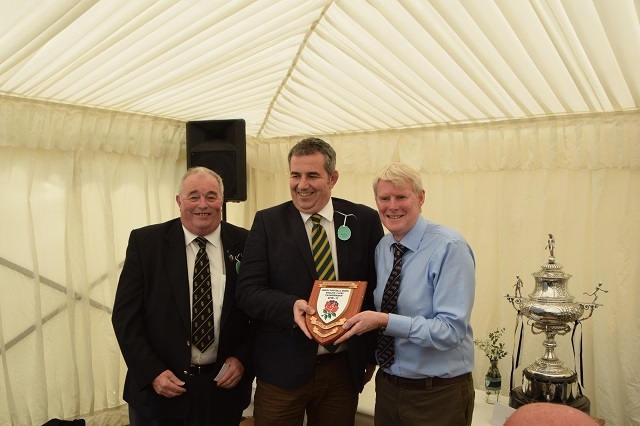 After losing two of their opening three games in November the side rallied to finish in runners-up spot. 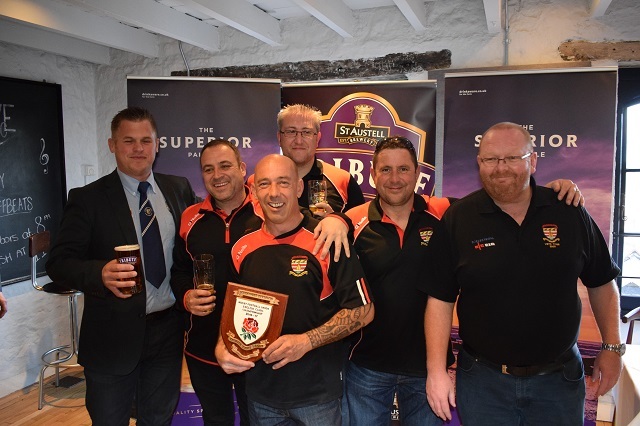 Hayle clinched the Tribute Cornwall 1 title in March with three wins and a walkover – including a 33-0 success over fellow front runners Newquay Hornets. 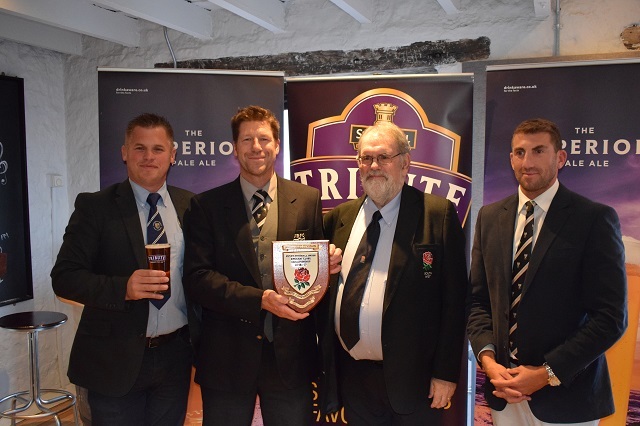 Their success earned them the award for Cornwall. 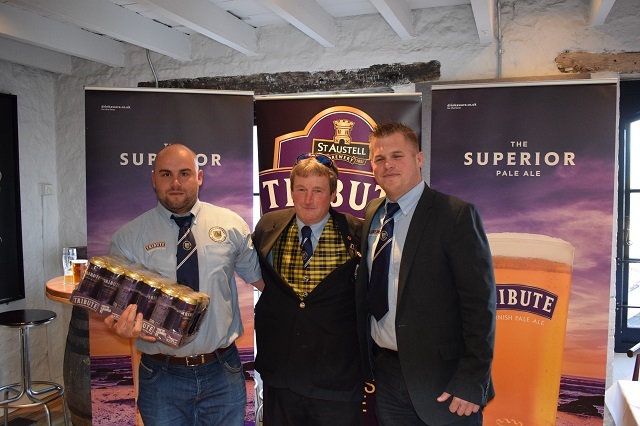 All three teams will receive a case of Tribute Ale from League Sponsors St Austell Brewery.